I have no idea who did this pic. 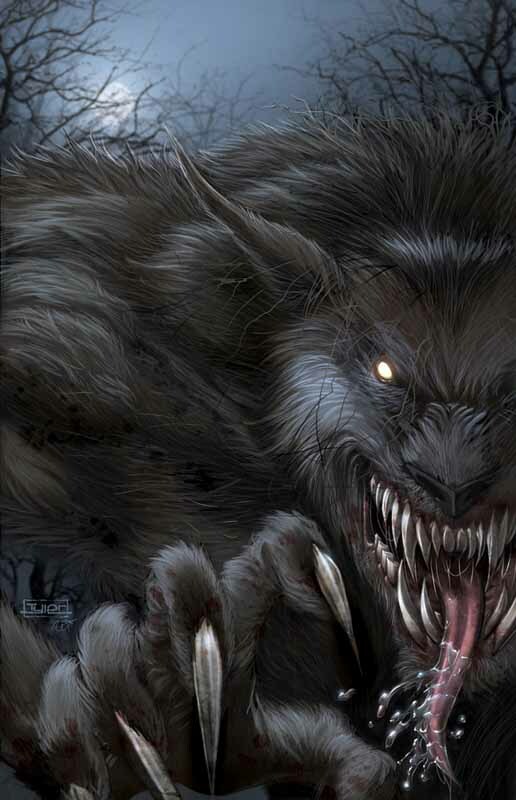 It's a standard werewolf pic from the web. No picture of Isaac exists at this time. Hopefully that will change someday. If anyone knows who did this picture, please let me know. This comes closest to Isaac, except the tongue is too long. Isaac can turn into half man half wolf shape as well as full wolf shape. In his half form he is seven feet tall, muscular and big. He has a snout and extended jaw as well at the pointed ears of a wolf. His legs are shaped similar to wolves and his feet are large paws while his hands are human shape with sharp claws. He has a red 'D' shape scar on his left breast. His fur is black and very shaggy. He has black hair and eyes in his human form and amber eyes in werewolf form. After the human boy called Thomas shot him, he is missing a shoulder. He is a bully. He treats his younger brother Cam badly. He always fights the werewolf Clancy for control of Dominic's personal werewolf pack. Angry and resentful after Thomas wounded him. Thirsts for revenge. Isaac has the standard werewolf abilities. He can transform into a half-wolf half-human form or all wolf form. In both forms he's stronger, faster and has better agility and enhanced senses. He can access his enhanced abilities and sharp nails and teeth even in human form. As an Alpha Wolf, he's immortal. He seems to age slowly, perhaps a year per one-hundred human years. Little is known of Isaac and Cam's life before they became werewolves. The werewolf Clancy bit both of them and brought the brothers to Dominic, the vampire lord. Isaac turned jealous of Clancy's status as pack leader of Dominic's personal guard and got into many a scuffle over control. In the latter part of the 1600's, the pack was sent to capture vampire children Annabelle and Roland Foresight. Their mortal friend Thomas wounded Isaac with silver shot, blasting away the werewolf's shoulder. Isaac would have died but Cam rescued him. Isaac saw it as a sign of weakness and punished Cam for decades after. Isaac resented Cam for the rest of his life afterward and abused his brother even more fiercely. Isaac made it his personal vendetta to kill Thomas for his injury. We know from other stores that Isaac met an early death that his younger brother blames Roland for. This is a story yet to be told.